Jez is off to Holland next week, for a handful of gigs, his first visit to the Netherlands for about three years. Details are on the GIGS page of this website. It’s his only overseas dates this year, until his American tour in September, unless you count a one-off in Rostrevor, Northern Ireland in March – Brexit permitting… Within the last couple of weeks Jez was in the studio with Scots singer Ian Bruce, recording a duet on an unspecified traditional folk song for Ian’s upcoming new CD. The session took place in Newcastle Upon Tyne, and Andy May from The Bad Pennies was also involved. Something to look out for… Jez is also about to (or maybe has already) record a track for a forthcoming CD featuring artists who use Fylde guitars. There was a legendary album brought out by the Fylde Instruments Company back in the mid-1970’s, and this is the follow-up, forty years later. It’s due for release this summer. No details yet as to what Jez’s track will be. 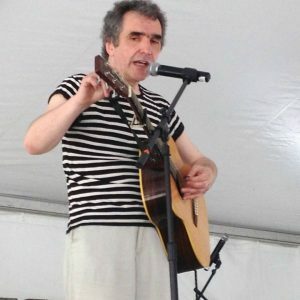 He seems to be in a traditional folk mood these days, so that may be the way this will go too… Meanwhile, there’s quite a buzz about Jez’s second novel, which is due to be published later this year. People are asking, will there be an accompanying CD, as there was with his last book The Dillen Doll. We have no news on that, and nor do we know if there’ll be a new CD release by The Pitmen Poets to coincide with their mammoth UK “Farewell Tour” in October… The one piece of “definite” news we do have, we are unfortunately forbidden to share with you, but it involves a very different sort of project, that Jez has been invited to take part in, and one that vaguely stems from the BBC Radio Ballads project, but is a live performance project. We’ll know more in a couple of months, and until then our lips are sealed… Tickets for The Bad Pennies Christmas Show (!!!) at Gateshead’s Sage on December 27th are on sale now! Two shows, afternoon and evening. The rest of the tour will be announced later in the year… Finally, a set list sent in by Robert Granger (thanks to him) from a solo show two weeks ago, includes some rarities, such as SEA AND THE DEEP BLUE DEVIL, CRAKE IN THE MORNING, DORANDO, THE BIG FEAR and NEW TOWN INCIDENT. The surprises just keep on coming!